Welcome to Academy of Training, New Zealand's premier training company. You can link into our wide range of training programmes, study the content of the programmes that interest you and make your bookings on-line. Our philosophy is simple. We aim to provide you with the very best in training backed by the very best in service. Our training is all about you - your requirements, your needs. We offer you personalised programmes developed by us, customised to your exact needs. We use only our own materials. Where we can, we use only live examples drawn from your environment, your experience. Our public programmes are true workshops - strictly limited numbers, individual attention and a high degree of participation and interaction. We are a private company established in 1994 by our principal consultant, Bill Butler, BCom, CA, Dip Soc Sci (Psychol). Bill has a wealth of experience in the training and development field. He has presented workshops and conference addresses for literally hundreds of Government, Local Authority, SOEs and commercial organisations for over twenty years. Bill was General Manager of the New Zealand Institute of Chartered Accountants, recently merged with the Institute of Chartered Accountants of Australia. Since establishing his own consultancy he has worked extensively throughout New Zealand and overseas. 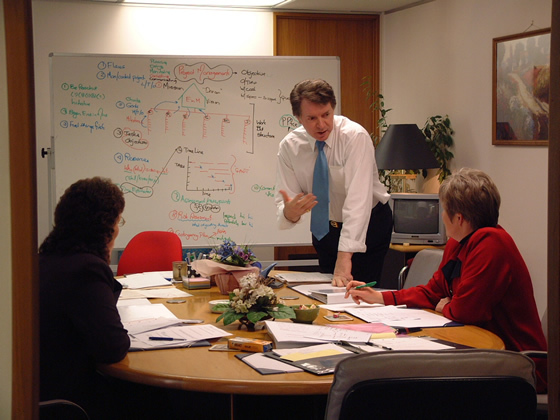 We adopt a consultative approach to all of our training to ensure your needs are met. Prior to every programme, we send you an objectives work sheet to complete and return to us. This helps us in our preparation for the programme to make sure the training is tailored to your specific needs. that the training environment should be supportive of the individual and their pace of learning. We have our own training rooms, furnished for your comfort, convenience and learning.